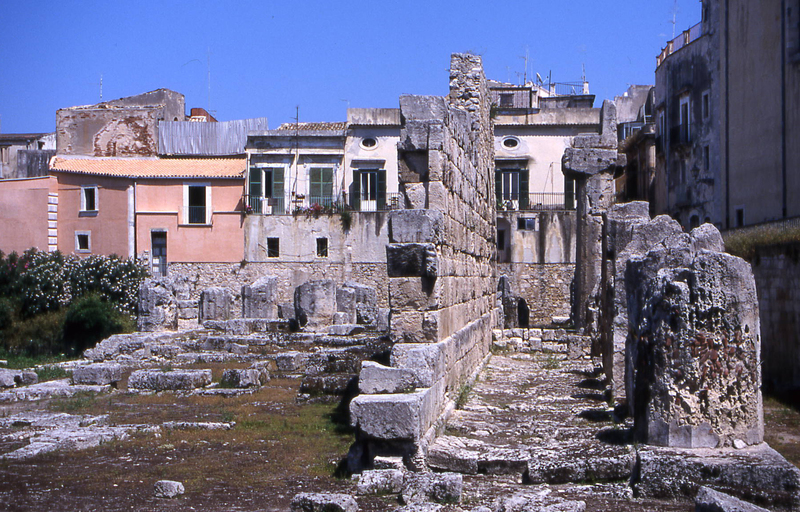 Syracuse (often spelt Siracuse) in south-east Sicily, is often overlooked in favour of the more touristy Taormina but the visitor to Sicily should not miss this city that was described by Cicero as the greatest Greek city in the world. Assaulted by Romans, Byzantines, Vandals, Arabs, Normans and Spanish, Sicily has absorbed these foreign cultures and made it her own, perhaps best exemplified by the Cathedral in the Piazza Duomo, the delightful pedestrianised square in the heart of Ortygia, the island in the centre of Syracuse. 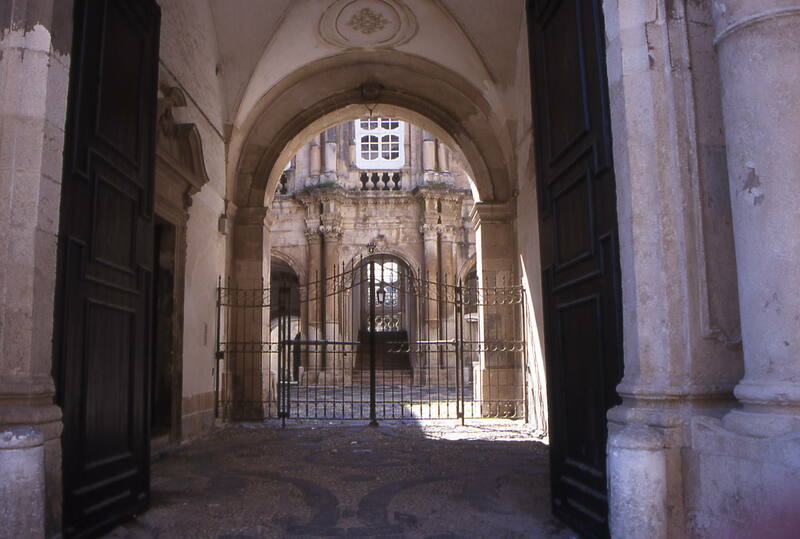 The façade of the cathedral is 18th-century and like so much of Sicily’s architecture, it was erected following the earthquake of 1693. It is actually built on successive altars to the Temple of Athena, the doors of which were said to be made of gold and ivory. Round about the 17th century the temple was transformed into a Christian church which later became the Cathedral. 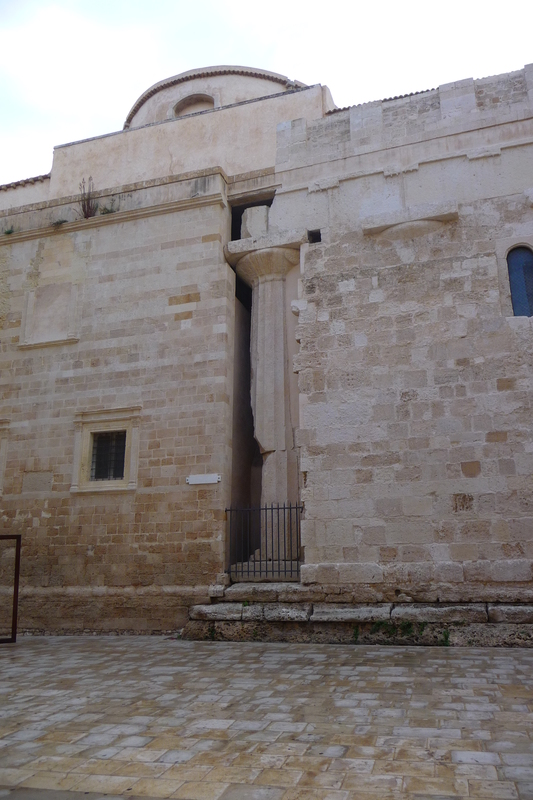 Walk down Via Minerva to view the outside of the Duomo and see how nothing was wasted: the giant Doric columns of the Greek temple to Athena were incorporated into the church that superseded it. The Piazza is regarded as one of the most beautiful in all Italy with the Cathedral on one side and various Baroque palaces dotted around the square. Day and night the piazza is a scene of energy and life as the ground floors of the once-great palaces now mostly operate as restaurants, cafés and bars. On a warm evening there is no better place in Syracuse in which to sit and enjoy an espresso or aperitif. There are two main areas in the town, the archaeological area which includes Greek and Roman theatres and remains, and Ortygia, a small island that feels more like a tiny peninsula, with beautifully restored Baroque buildings, a number of fine hotels and some great restaurants. In the Neapolis Archaeological Park situated in the northwest of the town, are a number of well-preserved Greek and Roman remains. The main attraction is the Greek theatre (not to be confused with the more often photographed Greek Theatre in Taormina which has as its backdrop the snow-capped Mount Etna) where the plays of Aeschylus and Euripides are still performed from May to the end of June each summer as they were more than 2,000 years ago. 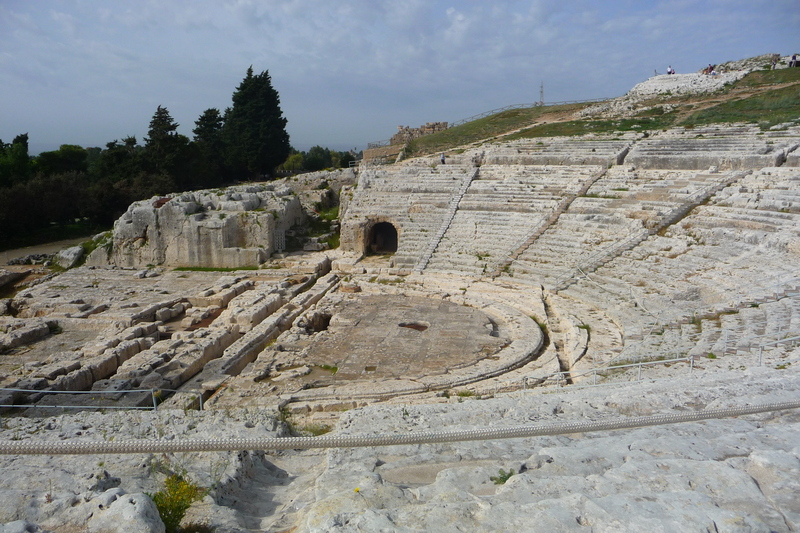 Started in the 5th century when Syracuse was one of the great cultural centres of the Mediterranean world, the theatre is considered to be one of the most perfect examples of Greek architecture to have survived and can accommodate up to 15,000 spectators in its 59 rows. 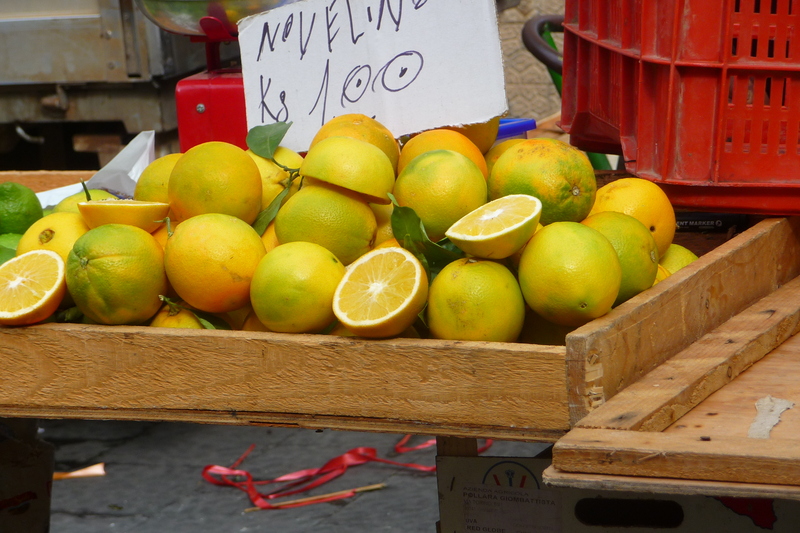 The nearby fragrant lemon grove was once an old stone quarry used at one time to house 7,000 Athenian prisoners of war, the limestone dug from it in 500 BC being then used to build Syracuse. 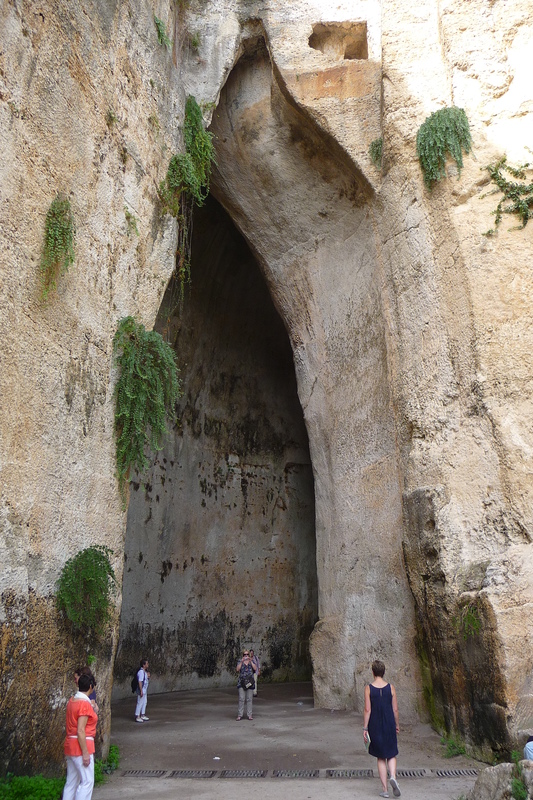 Wander into the vast man-made chamber known as Dionysius’s Ear, a 20m high pointed arch cut into the rock face which owes its name to a visit by Caravaggio in 1608. Used as a prison, the excellent Cathedral-like acoustics meant that the prisoners’ conversations could be heard from outside. 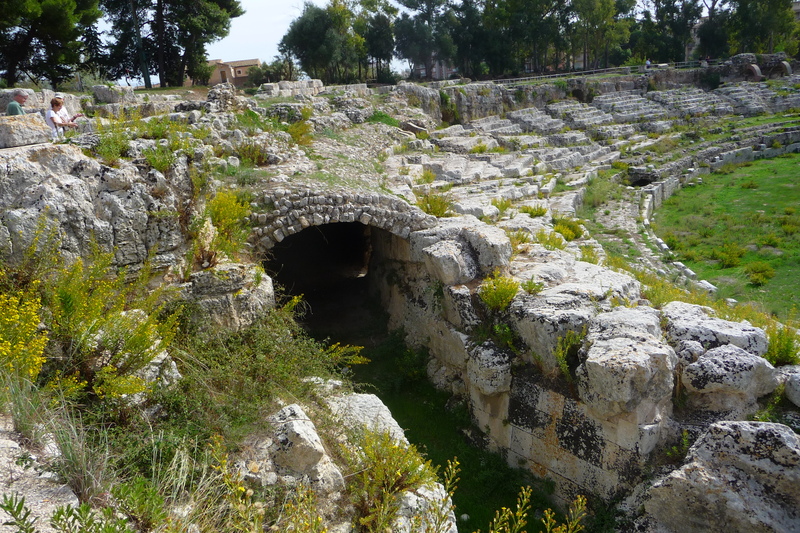 There is also an impressive Roman amphitheatre, approximately 140m long, built in the 3rd Century AD where traditional blood sports took place, gladiators and wild animals providing the blood-letting that was so much part of these offerings. The hole in the centre is believed to have been a drain for the blood and gore – as one guide told me – or, a space for scenic machinery – as another guide told me! The Archaeological Museum is just a short walk from the park and if time allows, it is worth a visit. 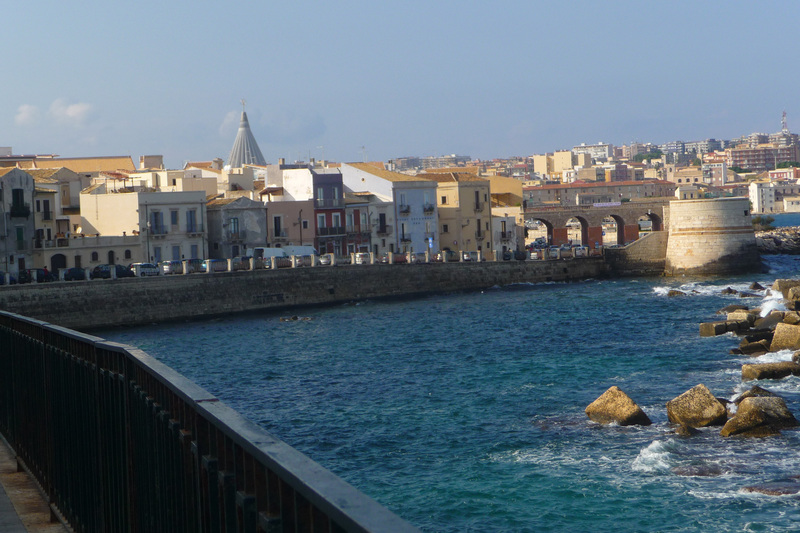 At only 1km by 500m, the best way to see Ortygia is just to wander through the area admiring the Norman buildings and the Baroque decorative facades. Enjoy the sun at one of the cafes in the area sipping a café or an aperitif, or lunch al fresco at one of the many good restaurants on this tiny island. 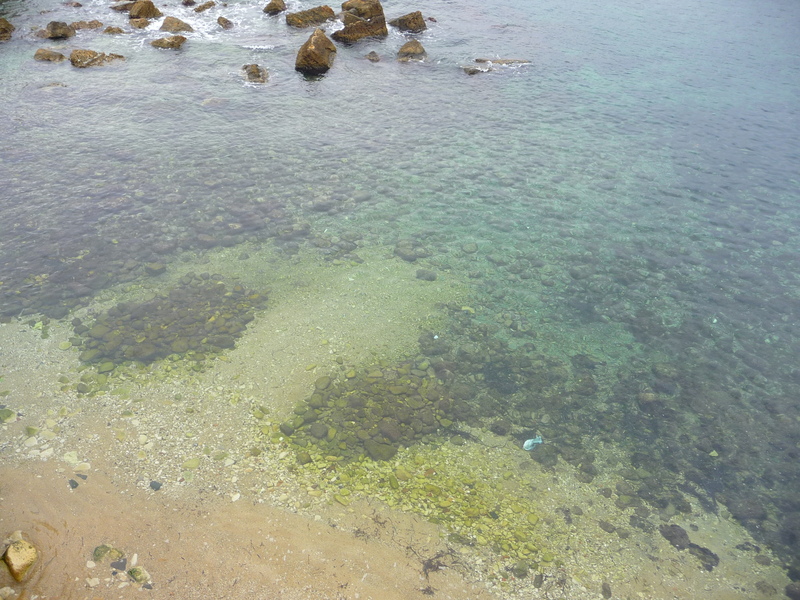 Take a picnic and sit on the seawalls and admire the fish that swim lazily in the clear waters of the bay. One could easily walk past the Fountain of Arethusa. 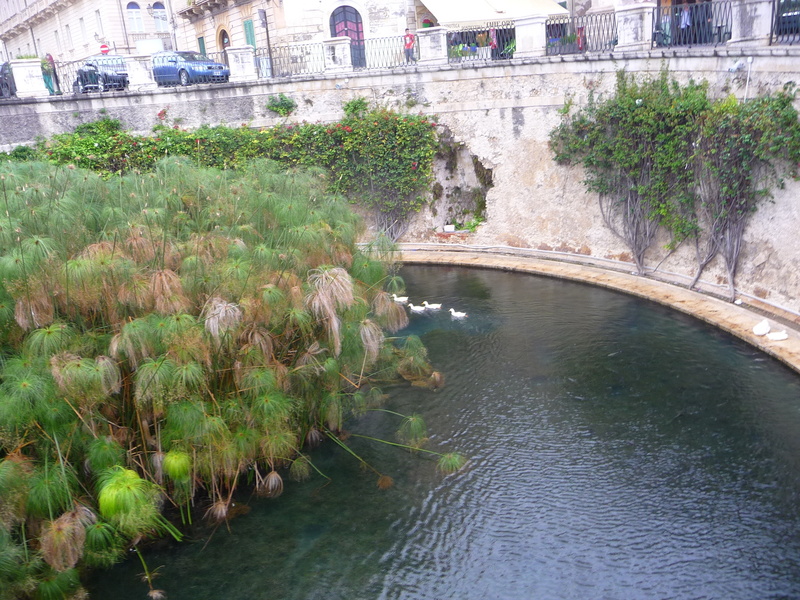 filled with white ducks and surrounded by walls of greenery, as it looks so unpretentious but it is one of the most important sights in Syracuse. Legend has it that the Arcadian nymph Arethusa, fled underwater to Syracuse to rid herself of the amorous advances of the God Alpheios and the Goddess Artemis transformed her into the freshwater spring that we see today. The ruins of this Doric temple stand incongruously in the middle of the town (you can’t miss it as it’s on a main thoroughfare), on one side of which is a bustling market with sellers hawking clothes, handbags, umbrellas and anything else that will sell. It seems such a pity that the Temple is not isolated so that visitors could enjoy it in tranquillity, but then it was probably full of bustling life when it was in use back in the 8th century BC when it was at its most active. It is the oldest temple in Sicily and over the centuries it has been a Byzantine church, a mosque and a Christian church. Plato visited Sicily several times as did Simonides and Pindar, and Aeschylus sang of its beauty. Its enormous military power made it capable of withstanding attacks from Carthage and Athens and it remained powerful until the Arab conquest in 878 when it lost its supremacy. Today Syracuse is a pleasant town in which to spend a few days – more if you want to travel beyond it, say to Noto, a perfect day out.